Strolling along the high street in the days after Christmas, one has the disquieting sense of having wandered unexpectedly into a pig farm. 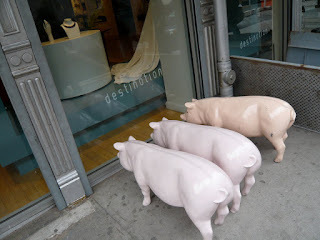 With their snouts snuffling away in the trough, all the little piggies are hard at it, buying, buying, buying. Of course, just when a degree of moral superiority threatens to elevate you above the jostling pigs, you discover that you’ve become the biggest porker of the lot. You gobble your swill and reflect on how much sheer, unalloyed pleasure is to be had from purchasing something that’s on sale. So much pleasure, in fact, that you start buying things you couldn’t possibly need or use. Take me, for instance. Among other odds and ends—a gadget for peeling bananas, an inflatable pillow you can use to take a nap on your desk, and something which might be a screw-driver, but I can’t be certain—I bought a pair of lady’s lacy black knickers, size small, which is utterly ridiculous, because I’m definitely a size medium. But there they were, on sale, so what could I do? More happy shoppers on the high street.